Jerry Jones of the Cowboys apparently isn't pleased with Ezekiel Elliott's suspension. 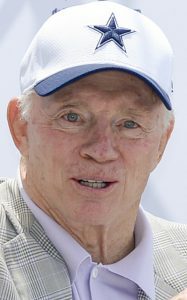 NEW YORK — Dallas Cowboys owner Jerry Jones has threatened to sue the NFL over a proposed contract extension for Commissioner Roger Goodell, a dispute apparently sparked by running back Ezekiel Elliott’s six-game suspension over alleged domestic violence, a person with knowledge of the situation told The Associated Press on Wednesday. Outlook: Adrian Peterson, reinvigorated at age 32, has been a workhorse with 134 and 159 yards rushing in two of his three games as a Cardinal, and Arizona wants to ride him like a rented mule. One problem: Seattle’s defense is really good. Arizona is a shaky .500. Look for the Seahawks to score first and win with defense. Jones told the six owners on the compensation committee he had hired high-profile lawyer David Boies and was prepared to sue if the group voted to extend Goodell’s deal. The person spoke on condition of anonymity because no one has been authorized to reveal details. Jones also has expressed disapproval with the structure and compensation in the contract extension, another person familiar with the proposed lawsuit said. That person also spoke on condition of anonymity for the same reason. The actions of Jones were first reported by The New York Times. All 32 owners voted in May to extend Goodell’s contract and authorized the compensation committee to work out the details. Goodell suspended Elliott in August after a yearlong NFL investigation. Prosecutors in Ohio declined to pursue the domestic violence case. PACKERS: Green Bay waived Martellus Bennett, bringing the tight end’s short tenure to a surprising end. The Packers cited a “failure to disclose a physical condition” for making the move. Bennett practiced Tuesday after the bye last week before going on the injury report with a shoulder injury. Bennett won a Super Bowl with the Patriots last year and signed with the Packers as an unrestricted free agent. VIKINGS: Minnesota took quarterback Teddy Bridgewater off the physically unable to perform list, adding him to the active roster for the first time since he badly injured his left knee during practice more than 14 months ago. Quarterback Sam Bradford was placed on injured reserve amid continued trouble with his left knee, and Coach Mike Zimmer announced Case Keenum will make his seventh start of the season for the game Sunday at Washington. SEAHAWKS: Eddie Lacy (groin) will be out and Earl Thomas (hamstring) is doubtful for the Seattle Seahawks heading into Thursday night’s game against Arizona.